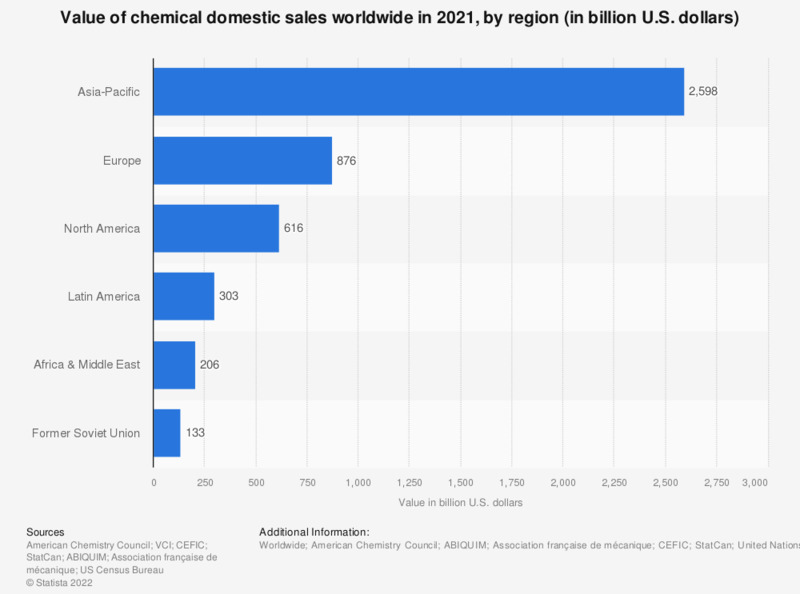 This statistic depicts the total value of all domestic sales of chemicals worldwide in 2017, broken down by region. In that year, domestic chemical sales in the Asia-Pacific region were worth some 2.46 trillion U.S. dollars. Thus, this region was by far the leading region based on chemical sales. According to the American Chemistry Council the chemical industry includes: basic chemicals, specialty chemicals, agriculture chemicals, and consumer products. Sales data is derived by subtracting shipments from exports and then adding imports; it is equivalent to apparent consumption. Figures for pharmaceutical sector are no longer considered in the 2018 edition of the report.